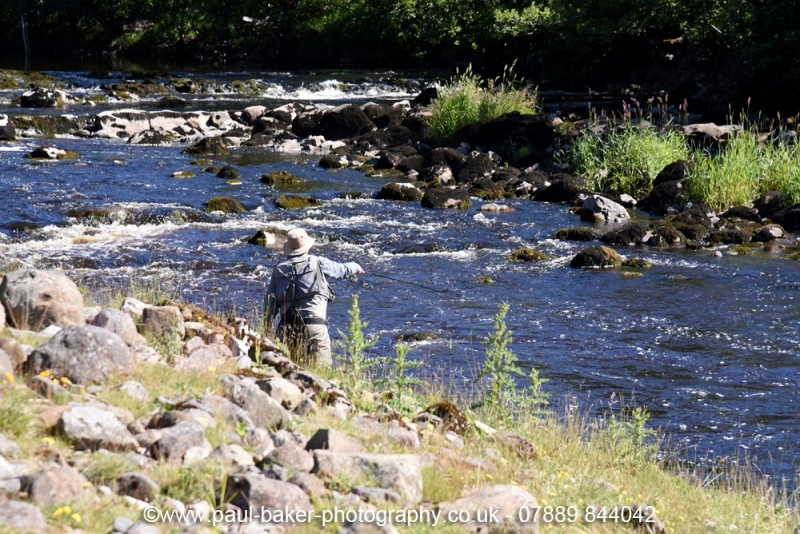 Me in action nymphing in the 2018 Rivers International on the Ure. Note how low my rod tip is! Euro nymphing is not high sticking! I was happy with this draw as you can imagine. This is a nymphers paradise and even a dry fly diehard like myself cannot resist. I finished the morning with two first places. 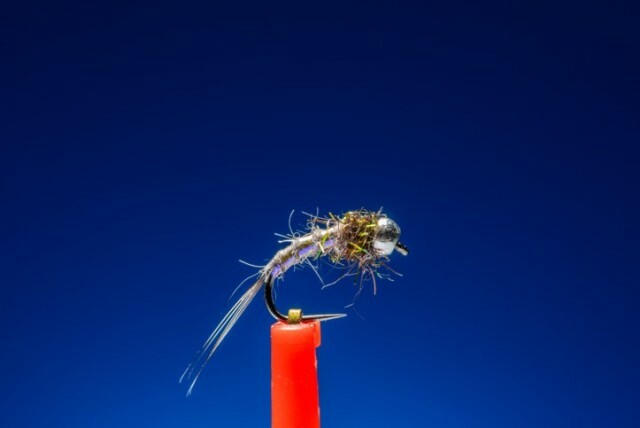 Our newest nymph which is a take on a perdigone is the glint nymph and it is perfect for French leader fishing both as a dropper and a point. 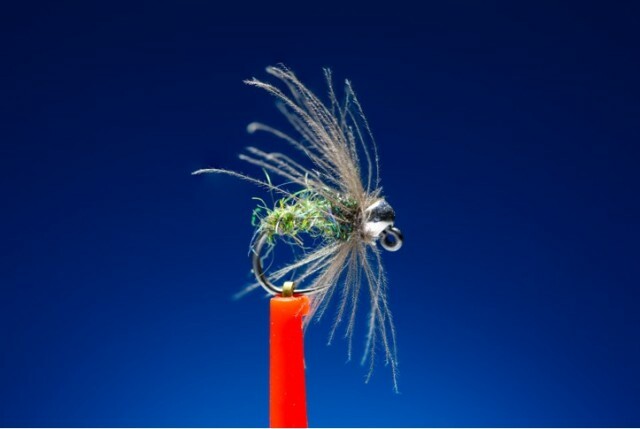 A simple nymph but with massive catching potential. It fast became a workhorse favourite for me during its development and was responsible for some very nice wild brown trout. An onstream-guide classic and a great all round nymph the black magic is now available on a 12 with a 3.4mm black bead making it just the right weight as a point fly in normal river conditions. Where few fish have seen the black magic nymph you are sure to make spectacular catches. A revelation has been the UV flash caddis now available on a 3 and a 4 mm silver bead. 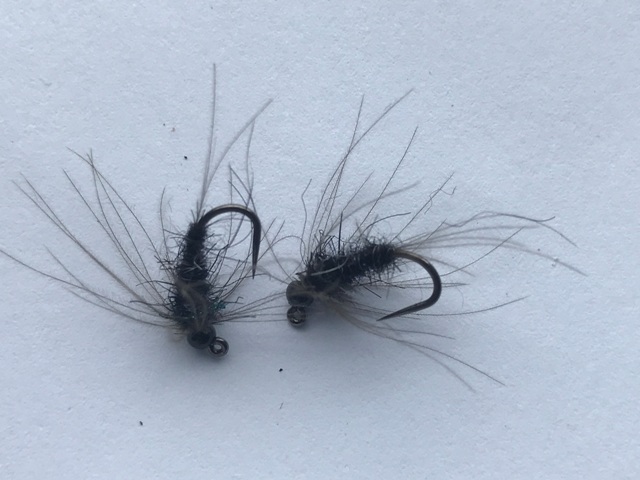 Traveling around Canada, British Columbia I doubt either of us fished another nymph pattern in 2018 other than the other dead cert- the black magic. We didn't have to! If fished were there they smashed it. On a run on The Elk river I fished with a line of nymph fisherman and landed 9 decent cuts while the other 5 struggled for one fish between them in the same time. This is a single hook Barbless fishery and I was fishing the UV flash Caddis Czech style under the tip. The takes almost ripped the rod out of your hand. 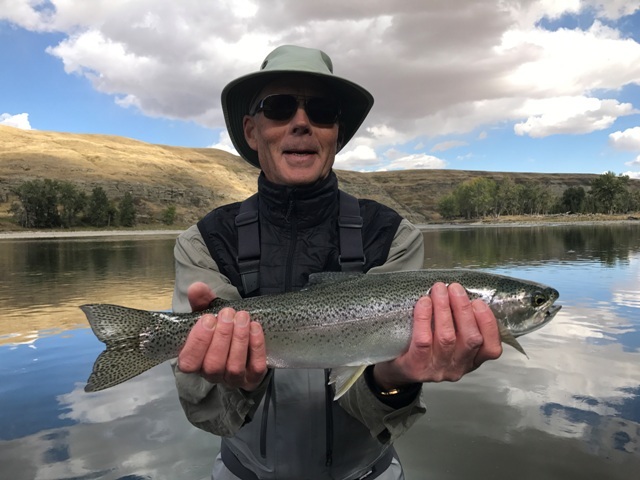 It was the same on native redband rainbows and we even got predatory bull trout on them as a bonus. Check out our latest nymphs including the copper faceted beaded polyphaetis. The polyphaetis is now available on a barbless size12 in both black and copper faceted tungsten bead. 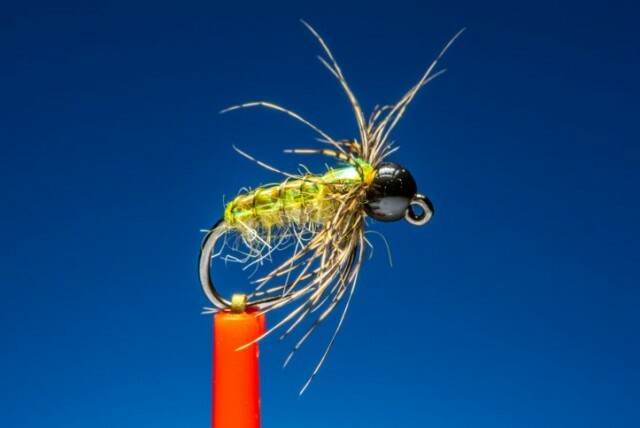 The flash back nymph has been updated and is available on a 3.4 mm black bead with dark or light olive finish. The glint nymph is the VW Golf of the nymphing World. Trusty, reliable, goes down like a lead balloon and will still out perform most of the competition. A soft motile tail is useful to add movement whilst not interfering with the nymphs ability to find bottom or a fish as fast as possible. On the super reliable B120 Hends Jig, super slim but attractive body profile. Available in black tungsten beads, for more subtle hard nymphed fish and silver tungsten for relatively naive or less pressured fish. UV sensitive materials are of course used! The silver beaded version is deadly for brownies but a must have for Winter grayling. Only £1.75 per Fly. Our tried and trusted onstream-guide range will remain because good flies remain good flies. In August 2017 we will be introducing our new Dynamic Nymphing range (DN). These nymphs designed by a triple England Rivers International have been directly influenced by the top of the competition scene and feature slim perdigone type profiles, hot spots and relatively large (oversized) silver beads. They have been thoroughly stream tested and found to be extremely effective. 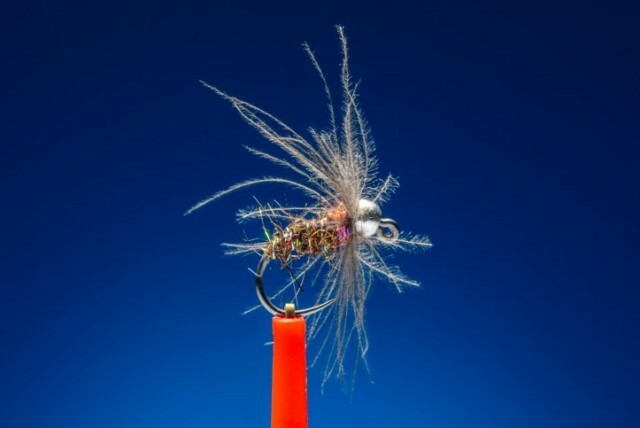 Although designed to be used in conjunction with double nymphing or French nymphing techniques they will work whenever fast sinking dense flies are required. The addition of a soft hackle adds that all important illusion of life. 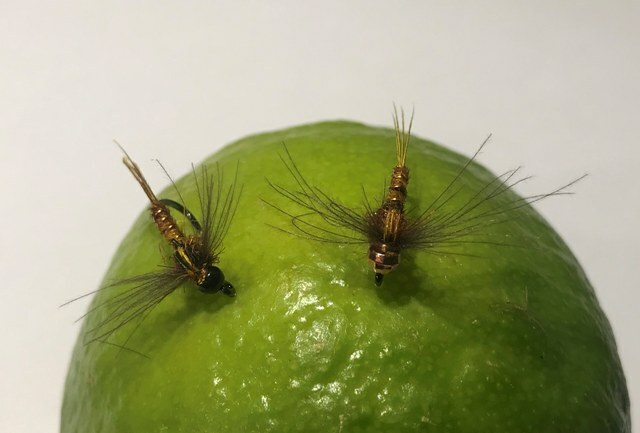 This is a fly that won me a place in the English Rivers Team in 2018. 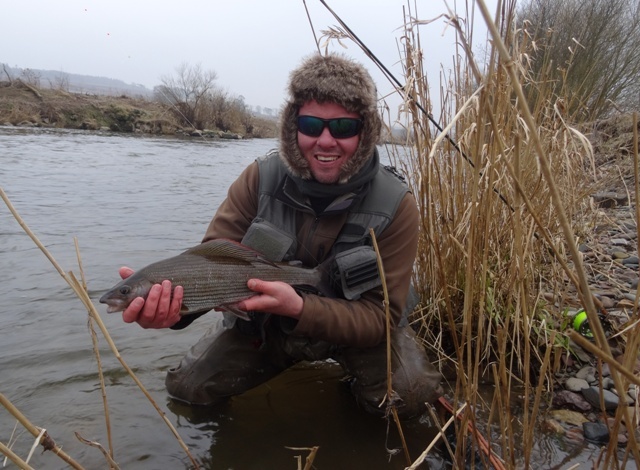 In the morning session I fished the river was 1.5 metres over normal and running like drinking chocolate. When you need a fly to be noticed this is a good one. In that session many excellent anglers blanked but I managed 2 in each session on this particular fly. Great in coloured water for browns. 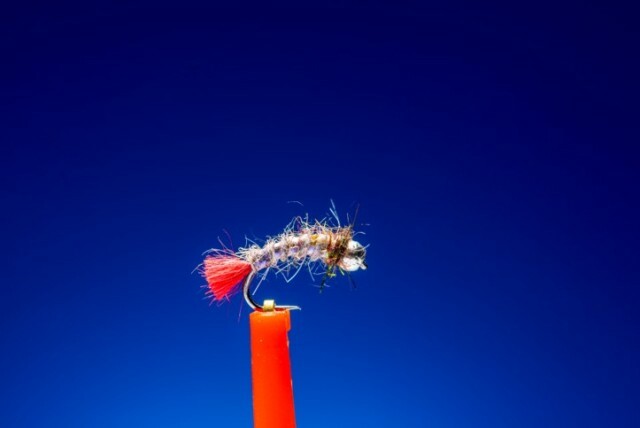 Featuring UV flash materials, a red UV micro chenille collar this fly is designed to capture a trouts attention fast usually resulting in rod buckling action. Tied on a size 14 Hends 124 barbless jig hook and a 3.8 mm Silver Tungsten Bead. 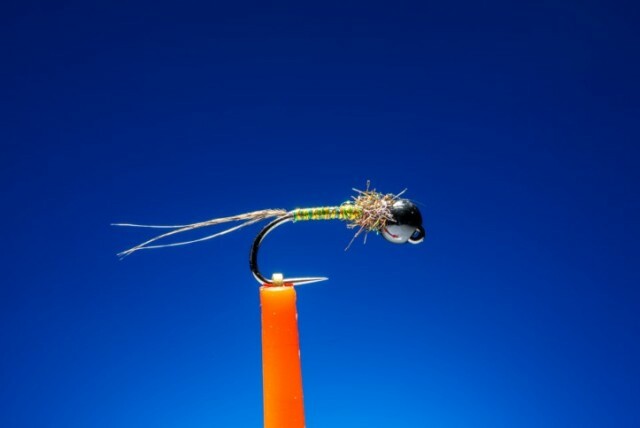 If a more realistic point nymph is required (crystal clear river) or desired the UV flash caddis is the answer. 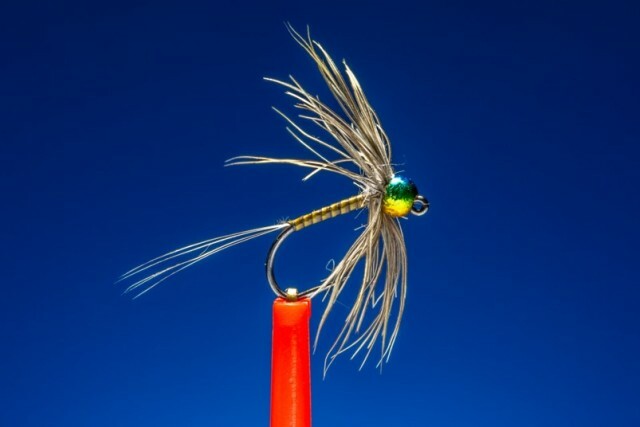 Subtle enough to fool the spookiest fish and the addition of a moving soft CDC hackle means even wary fish can be fooled. Tied throughout with UV active materials. Although this fly will catch on any stage of a nymphing drift fish will commonly follow the nymph and take it during the lift. It is again tied on the excellent and strong BL 124 jig hook size 14 with a 3.8 mm or now a new 3mm tungsten silver bead. 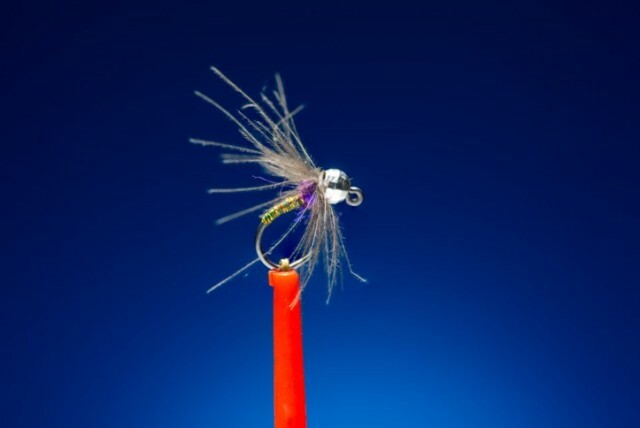 Our new point nymph available on a 3.8 faceted silver tungsten bead is the Purple and olive an unashamed rip off of a perdigone nymph but with a UV purple collar and a CDC hackle for added movement. A slim dense profile is contrasted by soft natural materials. The result, a nymph that looks like nothing in the river but that brings an electrifying response from the fish. Tied on a Hends 14 heavy weight hook for excellent penetration and holding power. Our dropper nymphs featuring 3mm silver Tungsten beads are the Red 5 nymph. Red 5 sparkles with glints of hidden red and includes a subtle alluring red collar with a delicate CdC hackle. At first sight not much difference to a standard dark hares ear but the fish notice that red and it usually produces a positive response. Our new range of this fantastic pattern includes a barbless 12 and copper beaded varieties. The Poly is an old school favorite that has accounted for more of my 3lb plus grayling than any other pattern like the fish below. On a size 12 heavyweight hook with a 3.3 mm black painted tungsten bead. The ultimate hares ear bottom bug and a perfect point fly on a French leader. 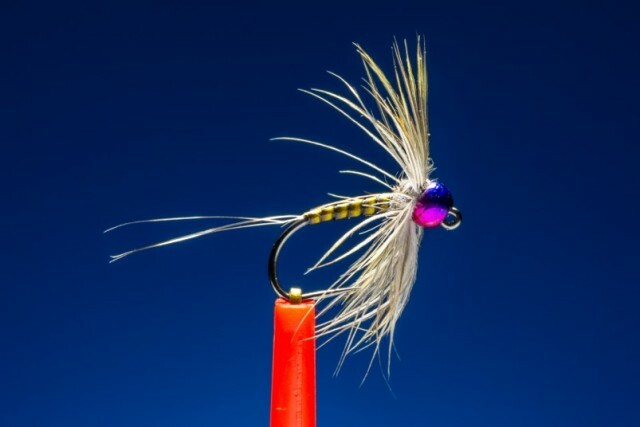 Both trout and grayling are real suckers for flies with a bit of bling. Combine this with a soft English partridge hackle which adds all important inherant movement and the fly becomes the ultimate bottom bug. 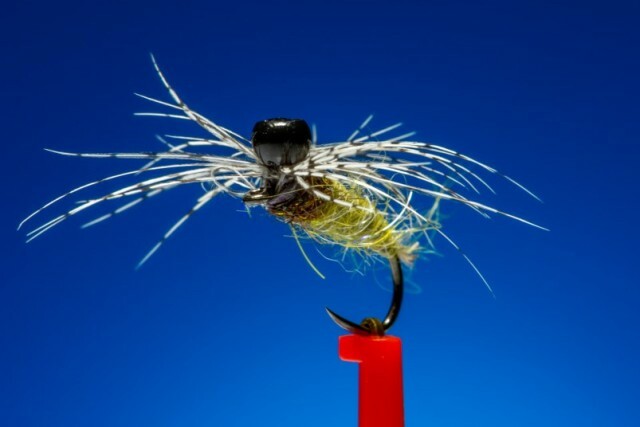 Designed to be fished on or near the river bed in gravelly/rocky environments this fly is one of my best catching flies. I often fish a polyphaetis on the point and this on the dropper when pocket water fishing for fantastic results. Our flash back are now tied on 3.3mm black tungsten beads and Hends BL120 size12 hooks and are available in light or dark versions. £1.75 per fly. 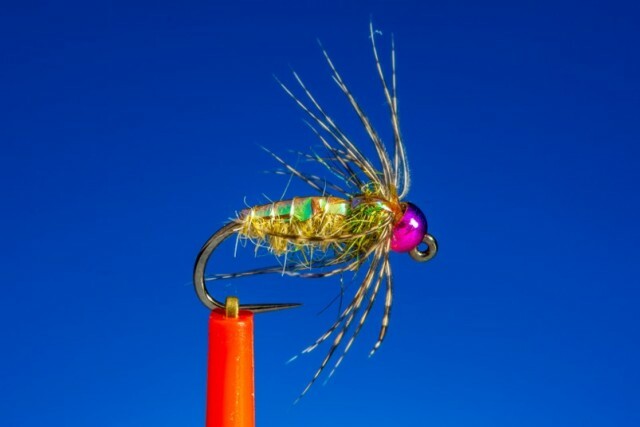 LIMITED EDITION- Rainbow beaded (3mm Tungsten) flash back caddis. Handsome fly which as proven to be a huge hit with the ladies. The odd big brownie likes it as well! £1.95 a fly. An Onstream guide classic. Dark or black indicates to a fish that something is probably of insect origin and therefore edible. A delicate CdC profile adds that all important Illusion of something soft, moving alive and tasty! 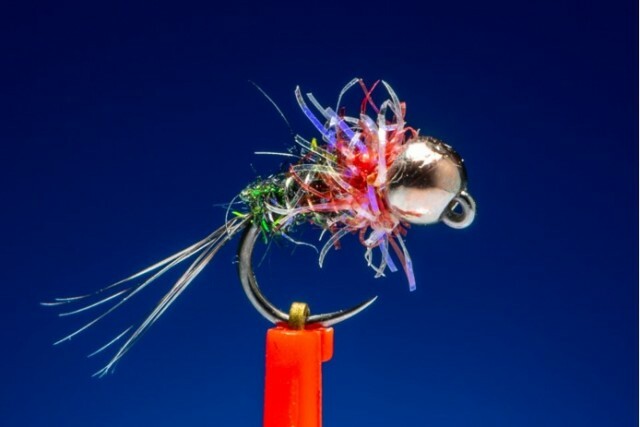 When this fly really works it is pointless fishing anything else. Probably one of my all time favourite nymphs for fishing duo style. Hit wherever its been fished including New Zealand, Australia, USA and Canada. Based loosely on Stewart's Black spider. Catches fish in rivers worldwide. Back with black painted beads which I think are the best! Size 16 2mm bead here. Now available in three sizes, 16 with a 2mm black bead, 14 with a 2.8 mm black bead and now 12 with a 3.4 mm black bead. All beads are tungsten throughout this website. 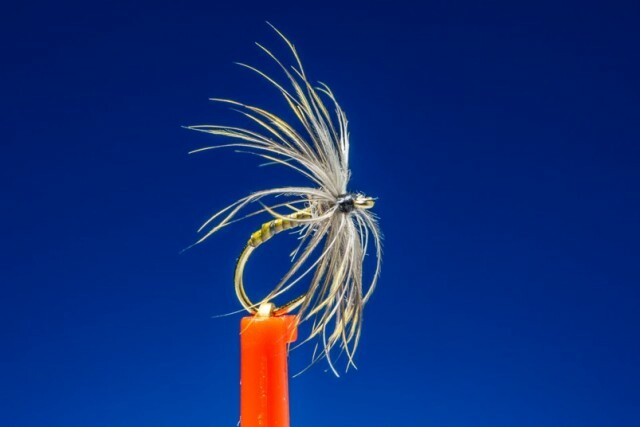 Certain patterns like Sawyer's Pheasant Tail nymph (PNT) have withstood the passage of time with good reason. They work! 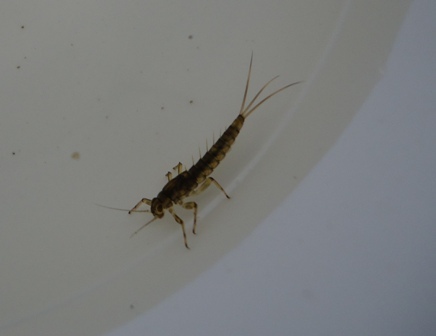 Many natural nymphs in rivers are agile darters like the one pictured. They are slim with distinctive bumps where the wings are developed and are often segmented. The pheasant tail mimics this perfectly. However even classics like the PTN can be improved. 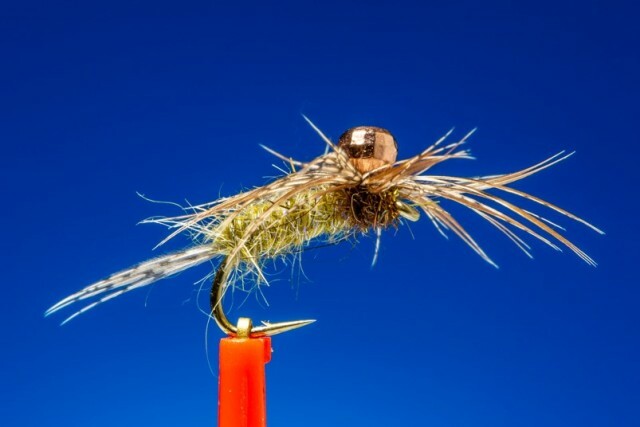 This onstream-guide.com version includes a CDC hackle to mimic the many legs and cilia (small hairs) on the natural bugs. It also includes a subtle but distinct hotspot. Enough to attract the attention of the trout but not so garish to have him bolting in fear. 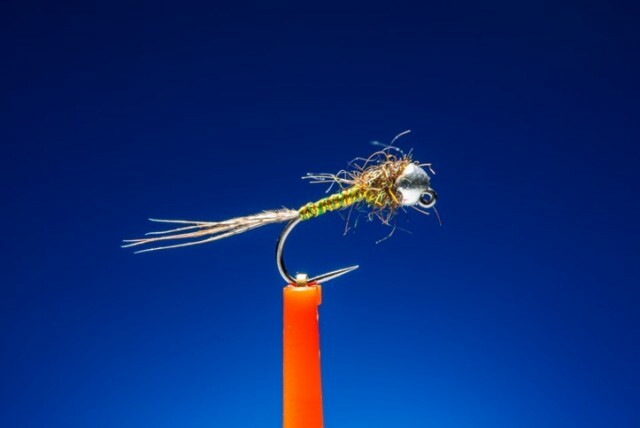 The wing pads are covered with a light covering of bug bond to leave an ultra tough little fly. Our latest version features picric substitute dyed pheasant tail which gives a fantastic attractive affect. Perfect for everyday nymphing and fished under a duo dry fly. The 2.3 mm copper diamond faceted tungsten bead ensures the fly gets down to the right depth quickly. New and approved! Or select a black painted bead. Tied on high quality Hends BL120 size16 Jig hooks. £1.75 per fly. Select black painted or copper faceted from the drop down menu. 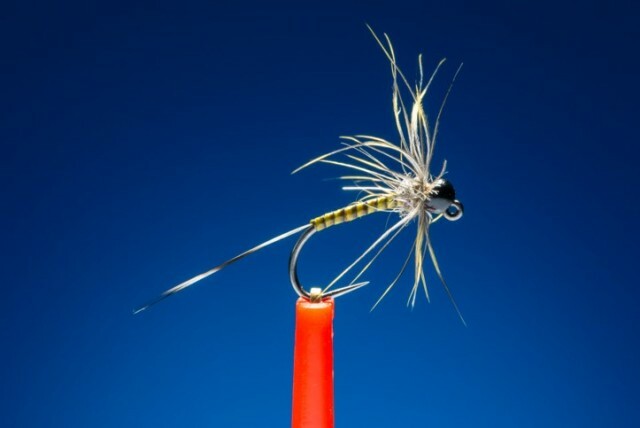 The hare’s ear in all formats remains one of the best all round river flies in the world! The mini and micro ribbed hare’s ears illustrated, are the result of many hours and weeks stream testing to find the ultimate small nymph pattern. 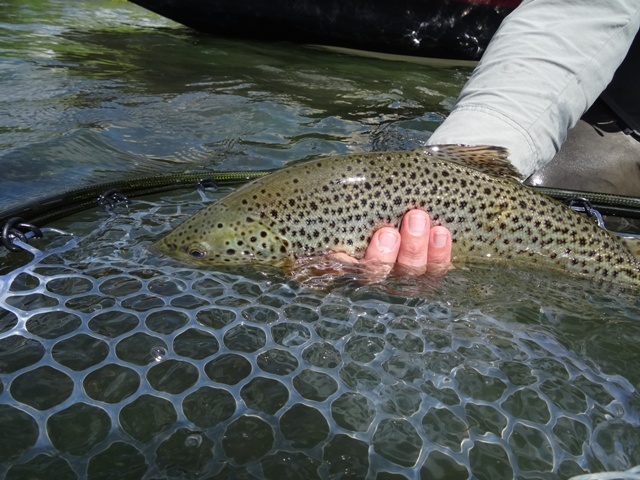 This is an important task given that the majority of kick samples in rivers generally uncover a collection of smudges usually size 18 or less. The silver 2mm tungsten bead adds mass and is suggestive of an air bubble. It is an extremely popular and successful bead. The red tag version of this fly has been a revelation and has landed more fish for me this season than any other pattern. And the plain version has been a go to fly in drought conditions. Available in size 14 and size 16. Perfect as a duo fly, as a point fly on a team of spiders or on the top dropper of a European nymphing rig. 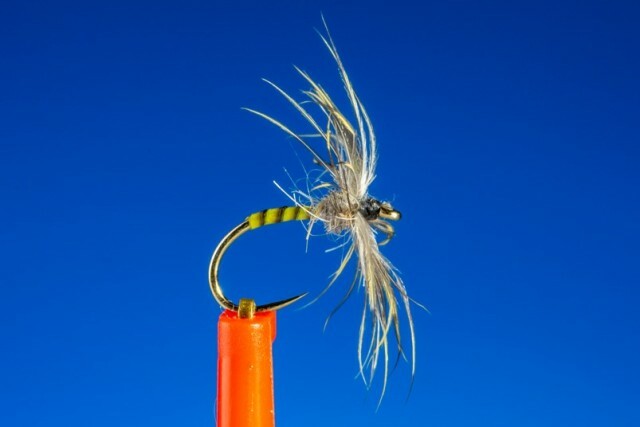 High quality Hends BL510 hooks used to tie these flies on. £1.50 per fly only! Please select required type and size from the drop-down menu. 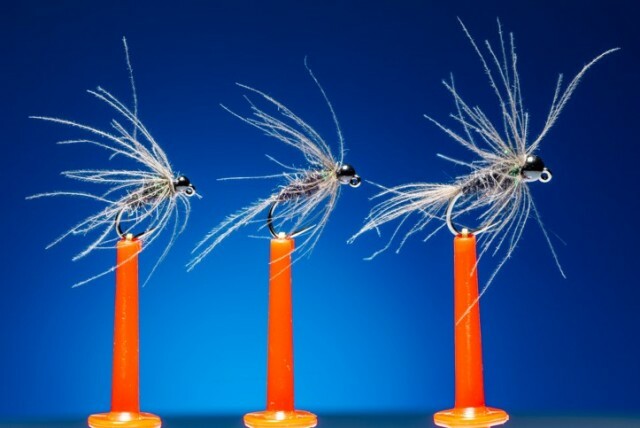 Spider patterns are versatile and can be fished in many ways not just the down and across or across and down methods. 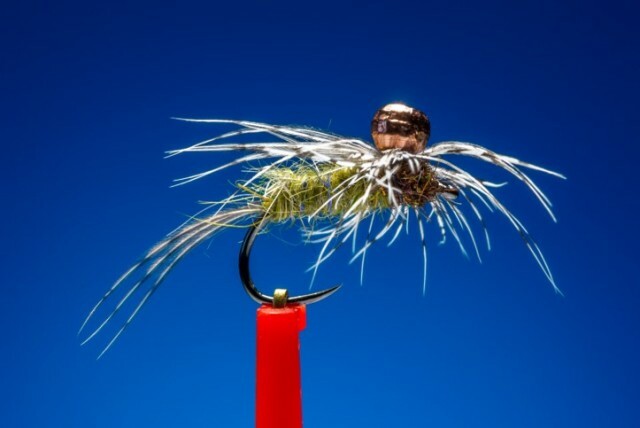 Add ghink to fish the spider as a dry where it gives a superb impression of a vulnerable trapped emerger. The great spider fishers of the past like W.C. Stewart in the Practical Angler insisted that spiders should be fished upstream and submerged. The hare’s lug, quill and plover spider can be fished with success using all these methods and is particularly effective in a hatch of olives. Available on size 14 barbless high quality Japanese Maruto D04 BL hooks. 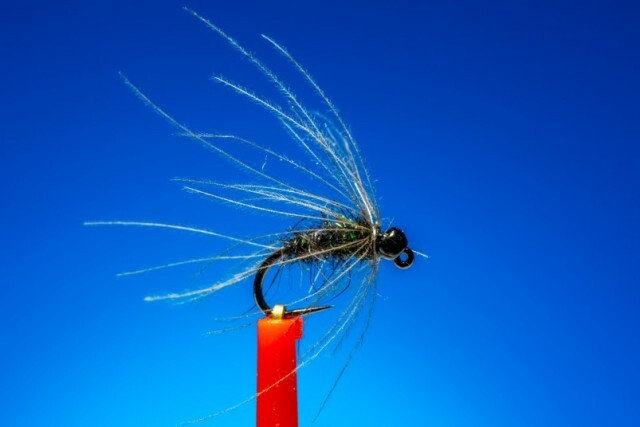 The nymph version of the hare’s lug, quill and plover can be added to a team of spiders to take them sub surface when fishing across and down or used as a duo nymph where it is a superb catching fly. It features a 2.3 mm black tungsten bead and is tied on a size 16 jig hook (Hends BL120). Only £1.65 per fly. Please add to cart. 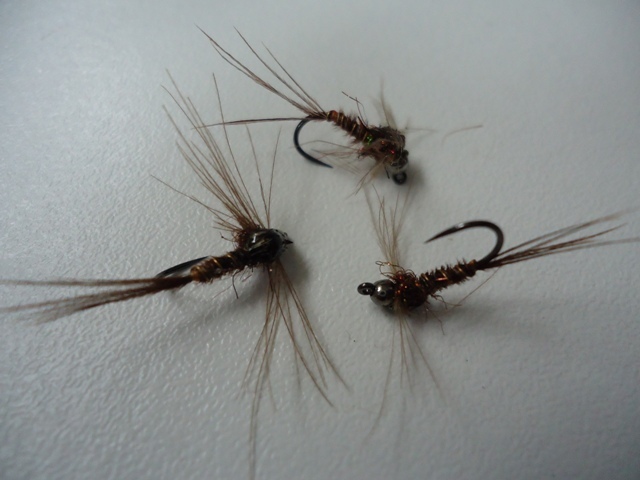 Tied on Fulling Mill grab gapes, stripped Polish Quills and the enticing golden plover feather plus a touch of UV hares lug these are simply gorgeous. Limited Edition and a phenomenal fish catcher! On a 16 and 14 (these hooks look big for stated size!) £1.85 per fly. The Onstream-Guide Fly Selection Boxes offer excellent value for money for premium river flies and include the fly boxes free of charge. 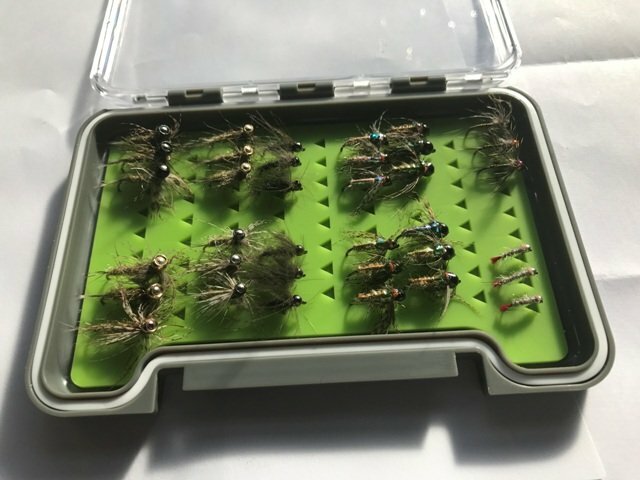 The nymph and dry fly boxes can be purchased separately below. These fly compilations are proven favourite flies that have worked in every stream we have ever fished all over the world.